We've taken a stroll down Buena Vista Street, through the second entrance of Cars Land and taken a ride on the three new attractions. Now let's take a cruise down Route 66 and see the sites. When you step through the main entrance into Cars Land you are instantly transported into the movie. Every little detail was inspired by the movie and the imagineers outdid themselves to capture the heart and soul of the little town of Radiator Springs. Even if you haven't seen the movie (why?!?!?!) the details will not go unnoticed. John Lasseter must be very proud. The cool part about this Radiator Springs is that you actually get to go into the buildings and explore. None of the characters enter the buildings in the movie so the imagineers had to create the inner decor for each building based purely on their imagination. A lot of time was spent developing a back story for each building and creating every detail to tell that story. 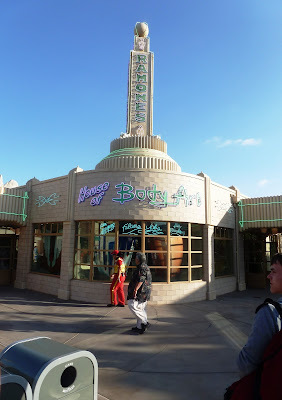 In the end, Radiator Springs has 3 stores, 1 restaurant, several snack shacks and a whole lot of character. 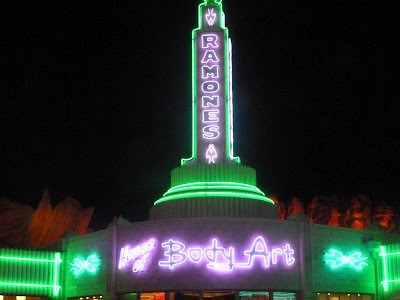 There are three stores in Radiator Springs, each with it's own unique merchandise. Helpful hint: if the stores within Cars Land do not have your size or what you are looking for, Elias & Co on Buena Vista Street carries a lot of Cars merchandise as well. Sarge's hut is the first store as you walk through the main entrance of Cars Land, so of course it is full of all things Cars for kids: toys, games, clothing - you name it, they got it! And in surplus we might add. Lizzie's store is next as you continue your walk down Route 66. The tacky, kitschy facade of this store is perfectly captured; the only thing missing is Lizzie sleeping outside. 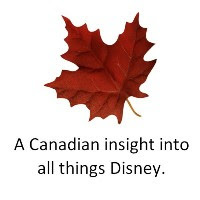 Not surprising, inside guests will find the traditional kitschy Disney merchandise, along with some necessities you might require as you enjoy the sights. 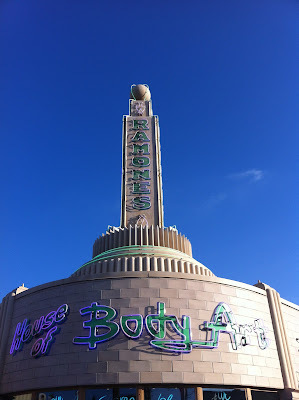 This store is endearing in all it's tacky glory! Helpful hint: this is the store in Cars Land for pin collectors! 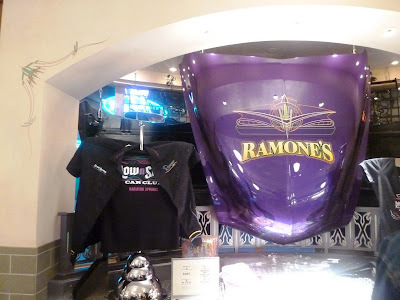 Inside Ramone's you will find merchandise for the "big kids" - clothing, collector's pins and artwork. 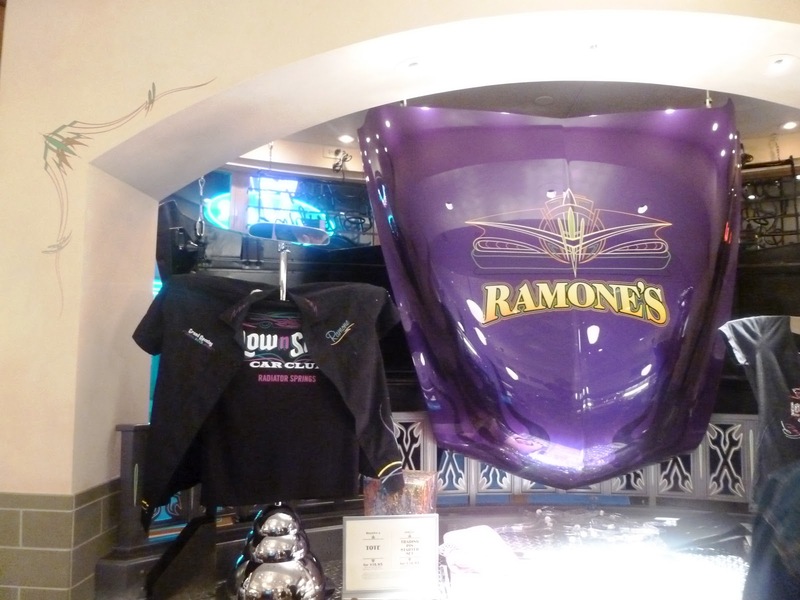 There are a few kid items in Ramone's as well, like a replica of the Piston Cup to bring home with your name on it. As part of the vision, John Lasseter did not want any food vending carts within Radiator Springs. Instead, cast members in candy striper type uniforms walk through the lines and offer guests an assortment of snacks; they even have cooler packs for yummy ice cream treats! But if you are walking through Route 66 and would like a snack as you go, or if you are feeling a little more hungry and want a hot meal, Cars Land has some delicious options not to be missed. The first pit-stop along Route 66 is the home of Filmore: the peace-loving hippie Volkswagen van from Cars. The tie dye decorations are hard to miss! Filmore's tent serves as a quick fuelling station with some healthier choices such as fresh fruit, trail mix and ice cold refreshments. 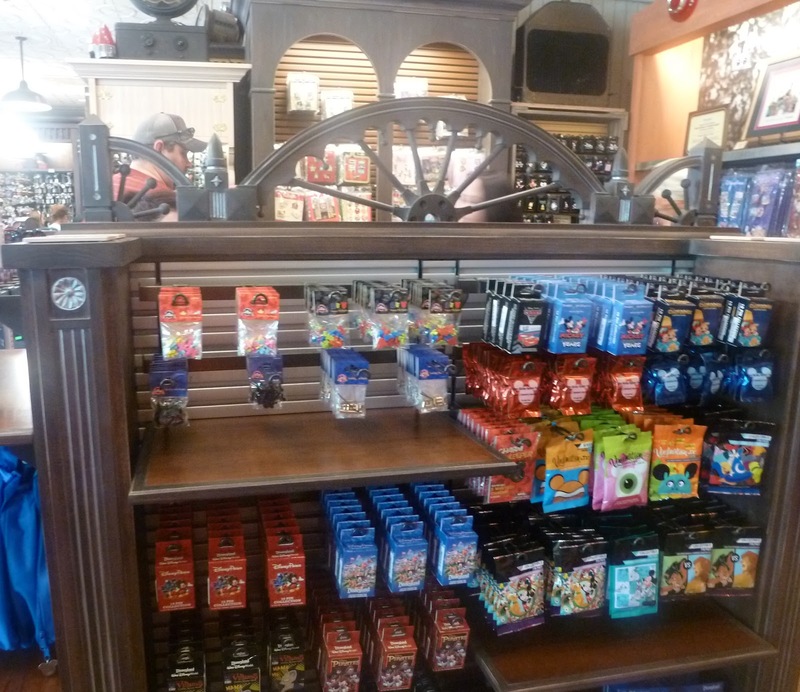 Guests can also grab some Disney potato chips, apple crisps or a crisp dill pickle. Filmore's is even more spectacular at night when all the psychedelic colours come to life! In the movie Cars, the Cozy Cone Motel is a quaint little motel designed to look like traffic cones. 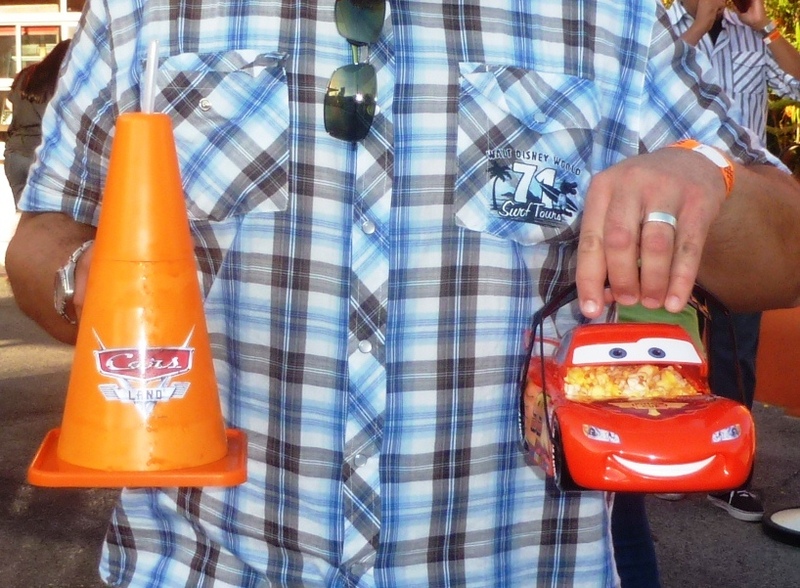 In the world of Cars Land, each traffic cone has a yummy 'cone' treat and beverage to satisfy every appetite. Guests can also purchase a souvenir cup in the shape of a Cozy Cone Motel at each 'cone' stand. These are a very popular item and sell out often. So if they are available when you are there, grab one! Cone #3: Chili Cone Queso. Here you can find two items: Chile Con Quesa and Chicken Verde, both served in a bread cone of course. And don't forget about the specialty drink: Fillmore's Fuelin' Groovy'ades. There is even an adult version of this drink. We tried the Bacon Scramble Cone. It was delicious. Cone #4: Frozen Cone-Coctions. The name of this cone stand is a little confusing until you notice the specialty drink is 'Red's Apple Freeze'. Pretzel Bites with Cheesy Sauce are also served here. 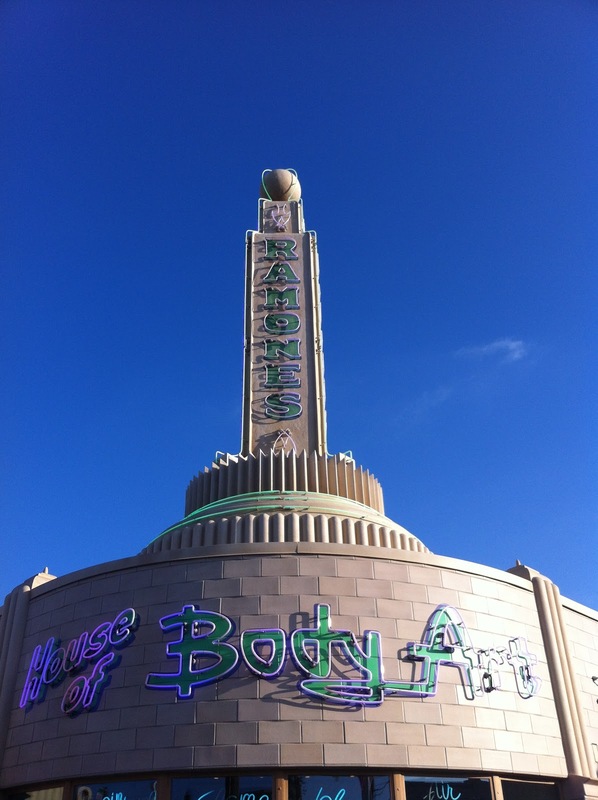 Cone #5: One of the most popular choices at the Cozy Cone Motel: Pop'cone'. As delicious as regular popcorn is at the Disney parks, Cars Land has decided to take it a step further and offer flavoured popcorn. The flavours vary every day tempting guests to come back on a regular basis. But did you really need an excuse? And if you are really lucky, they will have Lightning McQueen popcorn buckets. Another popular item that sells out often so be sure to grab one if you can. If you would like to see more pictures of the food, visit our friends over at Disney Food Blog. They do a fantastic job reviewing all of the tasty treats found in any Disney Park. If you need something a little more substantial to fill your tank while you explore Cars Land, head over to Flo's V8 Cafe for a hot meal during breakfast, lunch or dinner. Much like in the movie Cars, Flo's acts as a resting spot to refuel and relax while you watch the crowds flow by. Using the inspiration of the old drive-up diners along Route 66, Flo's offers ample outdoor seating to take a break. Hidden treasure: for a great view of Ornament Valley, grab a seat at the side of V8 Cafe - best seat in Cars Land. As guests enter V8 Cafe, Flo's story unfolds. Set in the hayday of the early 1960s, guests discover that Flo was a member of an all-girl motown group called "Motorama Girls". 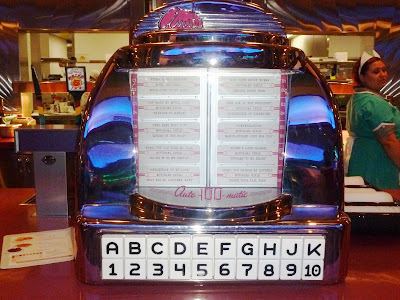 Memorabilia decorate the walls while motown music fills the air. The food at Flo's can only be described one way: All-American comfort food. Depending on the time of day, guests can order a traditional egg and bacon breakfast or a hot turkey meal complete with mashed potatoes and gravy. Flo's also has a vegetarian offering: the Veggie Tater Bake. Like all the other food venues in Cars Land, Flo's has her own specialty drinks. Our favourite is Flo's classic shake topped with "Road Gravel", which are little bits of cookie crumbs! Adults can also enjoy a glass of wine or beer with their meal. Once you pick up your grub, you have a choice of seating: Flo's Motorama Girls' side or Doc Hudson's garage. Doc Hudson's car garage seating is surrounded by automotive tools, diagrams and memorabilia from Doc's racing days. Be sure to walk all the way to the end of the seating area for the Hudson Hornet's museum featuring the three Piston Cups won by Doc himself. Before we leave Cars Land, there is just one more thing we need to mention: make sure you say hi to Stanley, the founder of Radiator Springs, before you leave.